Flowers depend on pollen for pollination, and flower-visiting bees collect large quantities of pollen to feed their larvae. However, there has been little work on flower-pollinator interactions in view of this conflict over pollen. Field observations suggest that flower-visiting bees have residual patches of pollen after grooming, and it has been hypothesized that these ungroomed body parts serve as "safe sites" that transfer pollen from one flower to another. Wester and colleagues tested this hypothesis with two experiments: one assessed bee grooming patterns, and the other assessed whether plants contact these safe sites on bees. In the first experiment, the researchers put individual Bombus terrestris bees and pollen grains in covered jars. As the bees flew, they stirred up the pollen grains and became evenly coated with pollen within minutes. After transferring the bees to clean jars and letting them groom themselves, the researchers counted the pollen grains that remained on safe sites. 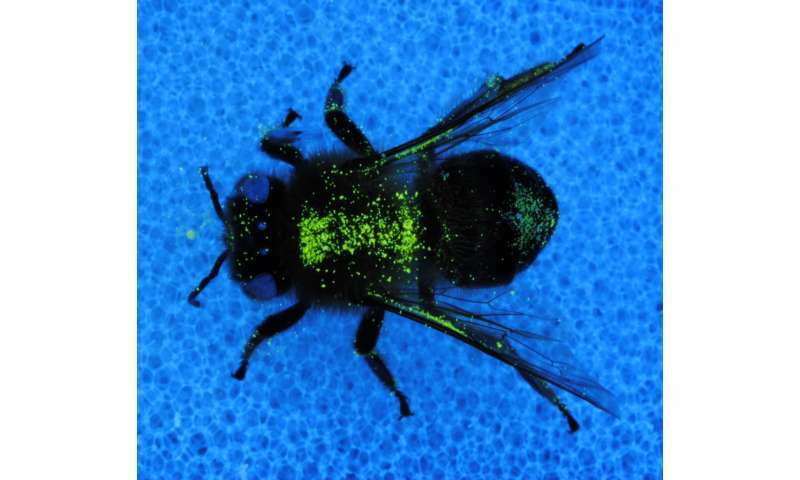 In the second experiment, the researchers put B. terrestris and Apis mellifera bees in indoor flight cages with flowers where the anthers and stigmas were marked with fluorescent dye. By observing the transfer of the dye to the bee, the authors could determine which areas touched the flowers' reproductive organs. The researchers found that B. terrestris and A. mellifera had similar safe sites after grooming, and that these areas were less groomed by the bees' legs. In both bee species, the waist had the most pollen, followed by the dorsal parts of the thorax and abdomen. Importantly, the fluorescent dye experiment showed that the flowers contacted these same safe sites, allowing for pollen deposition by the anther and for pollen uptake by the stigma. These findings could help focus future studies on, for example, the morphological match between pollinators and flowers, as well as on strategies that both pollinators and flowers use to bypass the conflict over pollen. For the first time, we experimentally demonstrated the position, area and pollen amount of so-called safe sites at the body of honeybees and bumblebees," says Wester. "We also showed that these specific body areas bees cannot groom are contacted by pollen-sacs and stigmas of several plant species, confirming the importance of the bees' safe sites." So, FIND a material that is sprayed over flowers to magnetically attract those pollen. This idea is for next millennium, I think. There are far more things out their to do first.